Weakness should persist and Q3 is in the cards. It would support stocks and contract the U.S. dollar. A Redemption Fund is gaining consensus in Europe. It can provide a solution to the debt challenge and possibly calm the financial markets. The financial markets are again hammered by the speculation, as the European crisis is intensifying. The U.S. dollar maintains its safe-haven status, while stocks could touch fresh lows short-term. The S&P 500 index has reached the important support line at 1280. The next target is 1240. Last week data confirms the U.S. economy is pausing, after few months of decent performance. The Gross Domestic Product (G.D.P.) is growing mildly near 2.0%. Consumer confidence, tracked by the Confidence Board Index, declined to 64.9. The business sector is strong, but payrolls are low and investments are limited. In reality, the manufacturing sector is still trending, despite the European turmoil. The ISM manufacturing index was 53.5 in May with new orders reaching the highest level since April of last year. How long will it last? For the second time in a row, non-farm payroll grew below 100,000. Chairman Bernanke said job growth must stay between 150,000 and 200,000 in order to sustain the economy. As a result, a new set of quantitative easing is a real possibility in the coming months. It will contract the U.S. dollar and limit the decline of stocks. In effect, the U.S. economy has still the capacity to overcome the challenge. Home sales are increasing, inventories are shrinking and prices are stabilizing in most regions. If history repeats itself, the recovery to new highs will take between 3/5 years from the bottom (2009/10). Inflation on the other hand is declining. Crude oil prices have lost more than 20% from the high. The contraction should continue until futures funds, heavily involved in the market, will liquidate long positions. 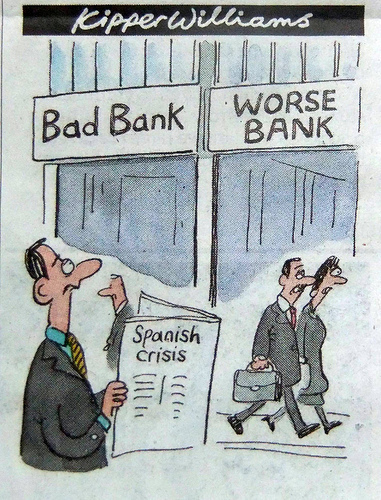 How bad are Spanish banks? Incertitude is mounting over the amount needed to bailout Spanish banks. Investors will not fund a recapitalization of Bankia, until they know the magnitude of the problem. Yields of Spanish bonds are already increasing near 7% on the ten-year debit. The Spanish government could ask Europe for help. The EFSF and the ESM were exactly created for bank recapitalization. However, the new government of Mr. Rajoy will probably wait until the last minute before moving. The social and financial costs will be much greater at that time. Austerity measures are clearly not enough. Last week, the E.C. published the Economic Sentiment Indicator. In the past, it has been a good indicator of the G.D.P. momentum. In May, it reached the lowest level since 2009. Demand is declining and hiring is shrinking. In this fragile scenario, the probability that the E.C.B. will shortly cut rates is increasing. Will Europe break into pieces? Time will tell. Nonetheless, the cost in terms of financial and moral losses will be so high that European nations will do anything possible to avoid it. With a referendum, Ireland has already said yes to the fiscal compact. Germany, which is not too convinced about issuing Eurobonds, will probably support the Redemption Fund. How does it work? The fund will assume all debt of European nations exceeding 60% of the G.D.P. The debt will then be repaid in 20/25 years at favourable interest rates. Germany and Italy will be the biggest debtor nations. Eur/usd is meeting a strong support at current levels. The next target could be 1.20, which corresponds to the lower channel-line. Nonetheless, futures funds are again massively short the European currency. According to the latest COT report, they reached the highest level in record. What is left to sell, if most big funds are already shorting the market? Commercial players have instead bought the currency at record numbers.